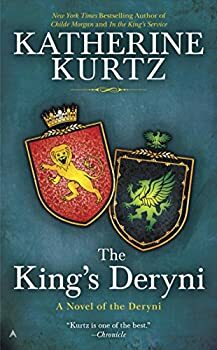 You can find a pronunciation guide and suggestions about the reading order for the Deryni saga at Katherine Kurtz’s website. 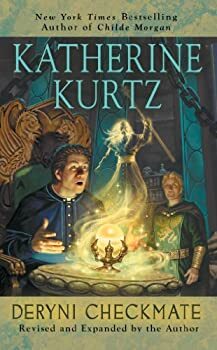 Katherine Kurtz is truly a mistress of fantasy — she's been writing high epic fantasy for 40 years and should be considered one of the post-Tolkien "parents" of our genre. The setting of the Deryni saga is an alternate medieval Europe (clearly analogous to our medieval England and Wales) and the Deryni are a magical race who look just like, and can interbreed with, humans. They have been persecuted for years by the Church (clearly meant to be our medieval Catholic church) and most people with Deryni blood choose to hide and/or deny their lineage and magical powers. Deryni Checkmate, first published in 1972, is the second novel in Katherine Kurtz’s epic fantasy series that’s set in a world called Gwynedd (loosely based our own medieval UK) where some people have inherited magic from a race called the Deryni which has interbred with normal humans. The church of Gwynedd considers magic anathema and is using its wealth, power, and influence to rid the world of Deryni magic. 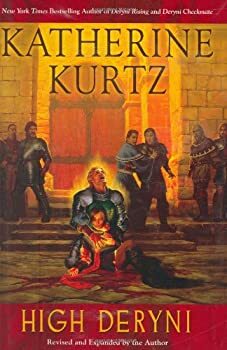 Thus, Kurtz’s story is clearly inspired by our own middle ages when the Roman Catholic Church dominated Western religious and political systems and, having strayed from its Biblical roots, lorded it over the political leaders and the rest of the citizenry. High Deryni, originally published in 1973, is the third novel in Katherine Kurtz’s DERYNI CHRONICLES. In the first novel, Deryni Rising, young Prince Kelson, who has inherited some Deryni magic, took his dead father’s throne after fighting an evil sorceress. In the second novel, Deryni Checkmate, tensions rose after the Church (obviously based on the medieval Catholic Church of our world) excommunicated Alaric Morgan and Duncan McLain, two of Kelson’s relatives and advisors. 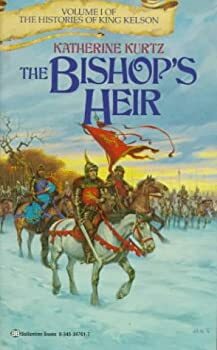 The Bishop’s Heir is the first book in Katherine Kurtz’s trilogy called THE HISTORIES OF KING KELSON but it’s a direct sequel to High Deryni, the third book in her CHRONICLES OF DERYNI trilogy. (Did you get that?) To get the most out of The Bishop’s Heir, you really need to read THE CHRONICLES OF DERYNI first. This review of The Bishop’s Heir will contain a couple of spoilers for the original trilogy. The King’s Justice is the second book in Katherine Kurtz’s THE HISTORIES OF KING KELSON trilogy, which is part of her DERYNI CHRONICLES. It’s the fifth book about young King Kelson. 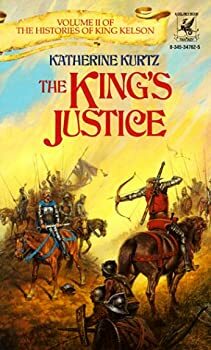 You really ought to read the books in this order: Deryni Rising, Deryni Checkmate, High Deryni, The Bishop’s Heir and THEN this book, The King’s Justice. 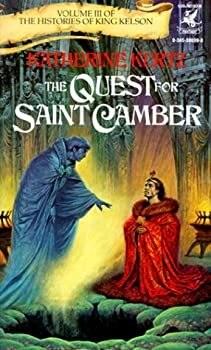 Even though The Quest for Saint Camber is the third novel in Katherine Kurtz’s THE HISTORIES OF KING KELSON trilogy, it’s actually the sixth novel about King Kelson and it’s part of her larger DERYNI CHRONICLES. You should read the books about Kelson in this order: Deryni Rising, Deryni Checkmate, High Deryni, The Bishop’s Heir, The King’s Justice, and then The Quest for Saint Camber. You might also like to know that this is NOT the last novel about Kelson. There is one more novel called King Kelson’s Bride that wraps up some loose ends from this story. 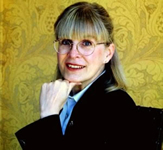 Katherine Kurtz published Deryni Rising, her first novel about young King Kelson, in 1970 and published The Quest for Saint Camber, which seemed to be the final story in the HISTORIES OF KING KELSON in 1986. Then, eleven years later, she published King Kelson’s Bride, a story that ties up many loose ends and answers a few questions about how life turned out for Kelson Haldane. There will be spoilers for the previous books here, so you may want to skip this review until you’ve read up to this point. King Kelson’s Bride begins about three years after the events of The Quest for Saint Camber. There are two major events going on in Kelson’s life right now and they will become intricately intertwined in this story. In the King's Service is the beginning of a new trilogy which details the recent history of the kingdoms that led to the events of her original series focusing on King Kelson, Alaric, et. al. (beginning with Deryni Rising). Though I suppose it could be read independently, I certainly wouldn't recommend it and advise people new to this world to start with her first trilogy (or possibly go chronologically starting with the Camber series depending on taste). 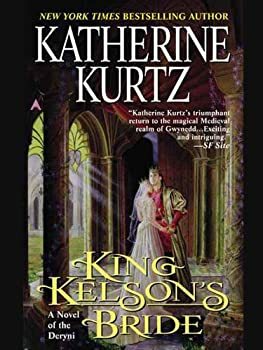 Katherine Kurtz’s first Deryni series introducing the land of Gwynneth and its young, just-made King Kelson and his advisor Alaric Morgan is a justifiably acclaimed fantasy classic. Since that first trilogy, Kurtz has given us several series of books dipping into Gwynneth’s far history as well as Kelson’s near future. 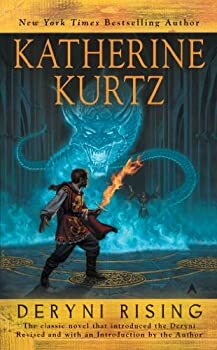 While, as is true of just about any such multi-volume fantasy series, there have been some stumbles here and there, for the most part Kurtz has maintained the high level of quality set by that first trilogy, especially with regard to the CAMBER OF CULDI series set in the distant past. I first encountered Katherine Kurtz’s DERYNI series back in high school with Deryni Rising, the first of her more than dozen novels in the long-running series. 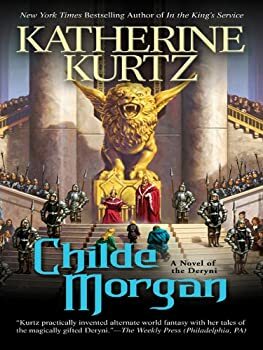 The newest entry, The King’s Deryni, is the third in the CHILDE MORGAN sub-series, and it brings her original readers full circle, since it ends just a few years before Deryni Rising begins. As with any series of this length, the quality of each book, and the degree to which it engages/compels varies, and honestly, this sub-series is not as strong as several of the others. 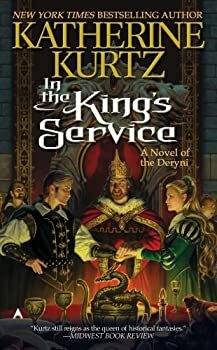 In fact, I had a lot of mixed feelings about The King’s Deryni, but despite the novel’s weaknesses, Kurtz’s smooth writing style and masterful conveyance of a medieval world of ritual remains a reliable constant. Within neo-pagan circles, there is a persistent legend that numerous British witches and occultists banded together during World War II, using magic to keep Hitler from invading Britain. I’m not convinced there was a huge organized effort, but I’m sure there were occultists in Britain at the time, and it would surprise me more if no one had tried to lay the magical smack down on the Führer. Katharine Kurtz uses this legend as the basis for Lammas Night. Adept — (1991-1996) With Deborah Turner Harris. Publisher: Sir Adam Sinclair, nobleman, physician, and scholar, is the only man who can stand against an unholy cult of black magicians threatening his homeland. Knights Templar — (1991-1998) With Deborah Turner Harris. Publisher: The military Order of the Knights Templar becomes embroiled in Scotland’s wars of independence during the late thirteenth century as two Templars set out to restore the powers of the famed Stone of Scone and save Scotland. Knights of the Blood — (1993-1994) Publisher: Los Angeles policeman Jack Drummond’s investigation of a 20-year-old unsolved murder leads him on a search through the pages of history and to a confrontation with the living dead. At the heart of the mystery is a vampiric order of Crusader knights dedicated to the destruction of others like themselves. Despite an overabundance of scene-setting, this series opener presents fast-paced action and an intriguing premise. Purchase where there is a demand for vampire stories. The Legacy of Lehr — (1996) Publisher: When four large blue cats with psychic powers come aboard an interstellar luxury cruiser, a rash of murders breaks out. Two Crowns for America — (1996) Publisher: A fantasy set in colonial America follows the struggle of America’s founding fathers against British tyranny, as they become pawns in a mysterious master scheme of conquest and power. St. Patrick’s Gargoyle — (2001) Publisher: As the millennium draws to a close, the gargoyles who guard the ancient buildings of Dublin come together to face an evil that threatens all they hold dear. This story of an eternal enemy is by the bestselling author of the “Deryni” series.